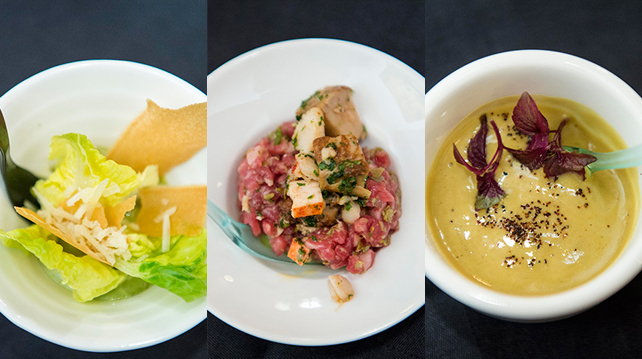 Le Meridien KL hosted Chef Igor Macchia for a one weekend only special visit back in July. 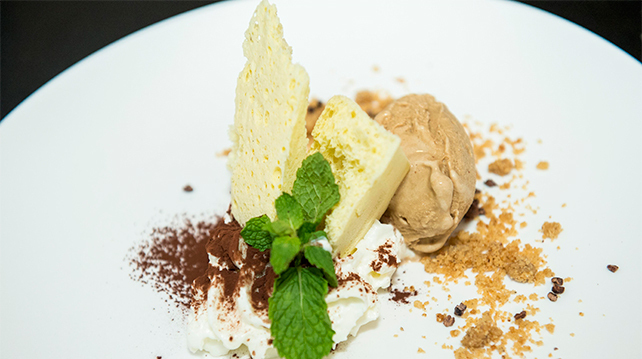 The brief guest spot, cleverly titled Eataliana, was hosted at the hotel’s rustic-style Italian restaurant Favola. 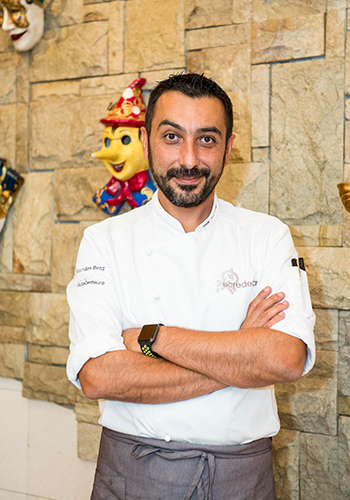 Celebrated Chef Macchia started his restaurant La Credenza in his hometown of Torino, Piedmont, earning a Michelin star one year after opening, and has since been jet-setting around the world to share his culinary expertise. He has another restaurant in Taiwan, La Festa, following many years of visits to Asia. 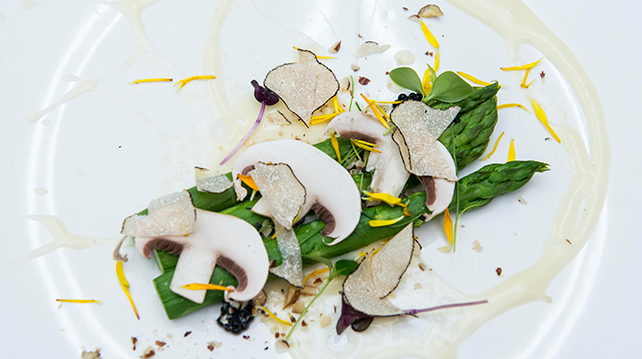 For this special four-course dinner Favola paired his sumptuous signature dishes with a selection of Frescobaldi wines from Tuscany, imported by Sunrise Wines & Spirits and are currently available at the restaurant. The evening was a delightful experience of the best of Italian food and wine. The crisp white wine Chardonnay di Toscana was served together with a trio of canapes (the Chef Igor Special Caesar Salad, beef tartare, and mayonnaise foam); described as a wonderful aperitif wine, it’s smooth and fresh with citrus notes, making it a great addition to light charcuterie or a vegetable-sauced pasta. Comprising of a blend of Chardonnay and Pinot Bianco, the lively Pomino Bianco is another good aperitif wine that is flowery and fruity. Served together with a vegetarian plate of steamed asparagus with fondue cheese and black truffle, as well as salmon fillet drizzled with smoked mayonnaise miso and sesame, it really shone against the fish – the clarity of the wine picked up the freshness of the salmon, making an absolutely sensational pairing. The rich red wine comes from hardy Sangiovese vines (as well as complementary varieties like Malvasia Nera, Colorino, and Canaiolo), that gives strong notes of black berry fruits and spices like cinnamon and black pepper. 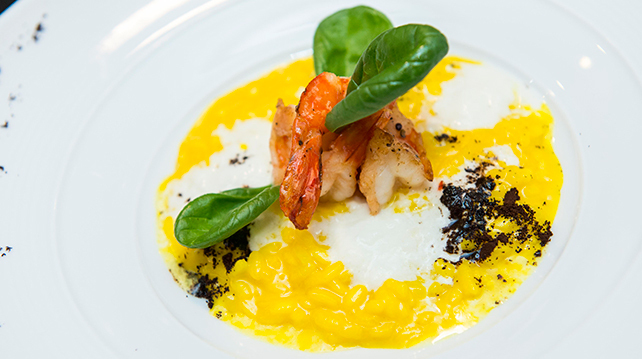 Chef Macchia served a saffron risotto mixed with burrata, pan fried prawns, and the surprising addition of coffee powder for an interesting added texture to an otherwise typically goopy dish (when asked why he added the coffee powder, Chef Macchia simply answered “because I like coffee”). The Nipozzano nicely cut through the richness of the risotto and grounded it. Fun fact: the Frescobaldi family have selected Vecchie Viti to continue the tradition of reserving a private-collection wine for each new-born family member. 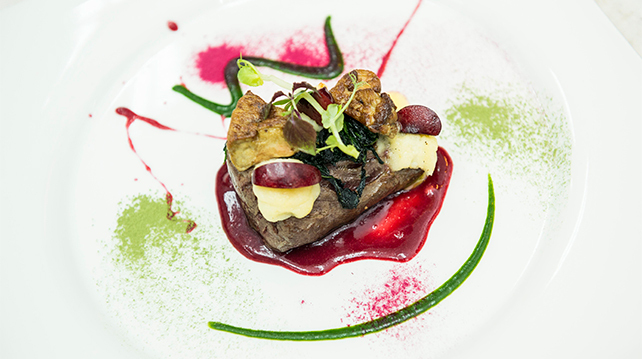 The second red wine of the evening, also a Sangiovese variety, went together with a choice of either grilled wagyu beef in cherry jus, with foie gras and potatoes, or lamb marinated in coffee with sweet corn ragout and aromatic cress. It’s an elegant, floral wine, with notes of raspberry and pomegranate, as well as a mineral persistence, which is well suited to beef stews and braised meats. Having ordered the wagyu, we found the CastelGiocondo brought out the sharpness of the cherry (both the whole fruit and the sauce) and complemented very nicely the richness of the wagyu. Wrapping up the evening, diners were treated to the Chef Igor Tiramisu – a modern, deconstructed rendition of the traditional Italian dessert, featuring a coffee ice cream, biscuit shards, and whipped mascarpone cream with a dusting of dark chocolate powder, served with a slightly fizzy Moscato dessert wine not from the Frescobaldi portfolio.